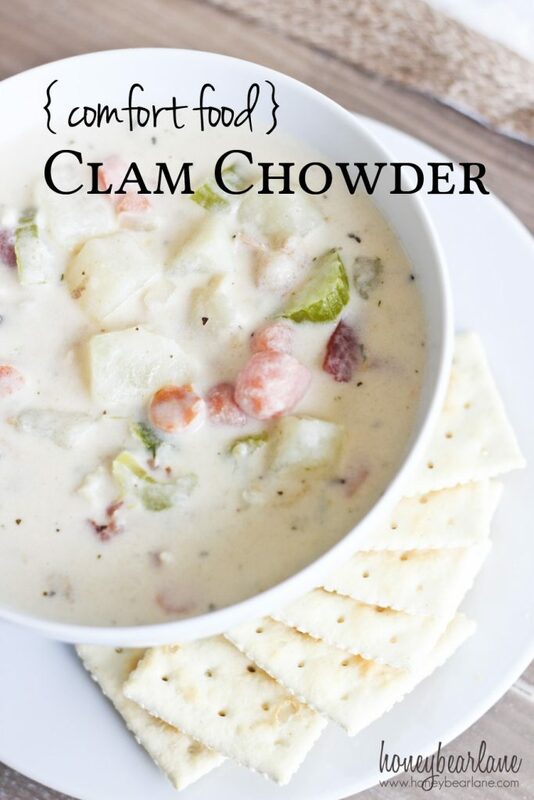 We are big fans of clam chowder in my house. There’s really nothing like it, and it’s best fresh. And by ‘fresh’, I mean mostly fresh veggies but I also use some canned goods too. 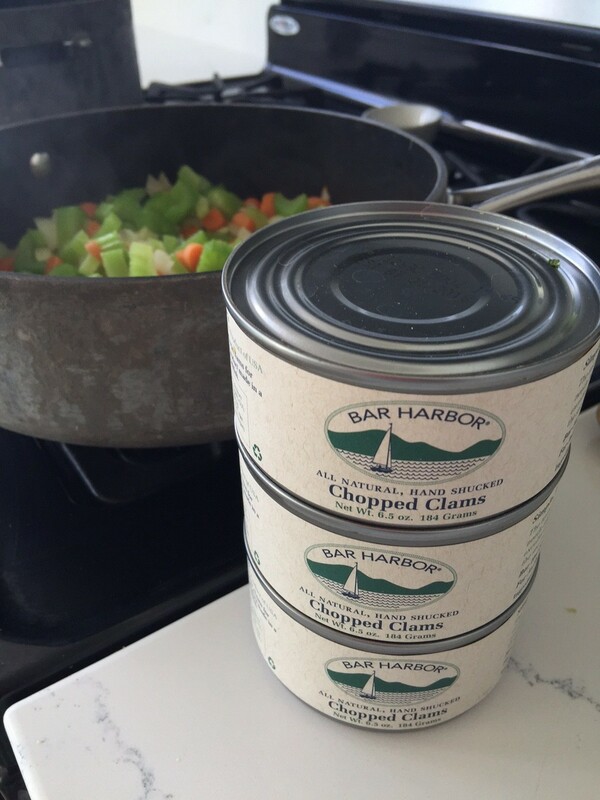 I don’t live near the ocean and so getting fresh clams is not really a priority–especially when the canned clams are pretty darn good. And ps, super convenient. It’s not unlike making a pasta dish or another kind of soup. The secret to really flavorful bases is to fry up about 6 slices of bacon in the bottom of the pan. Once the bacon is cooked, remove it and then you can sautee onions, celery, and carrots in the bacon drippings. I find this really releases the flavor of these veggies and seasons it with the bacon drippings. 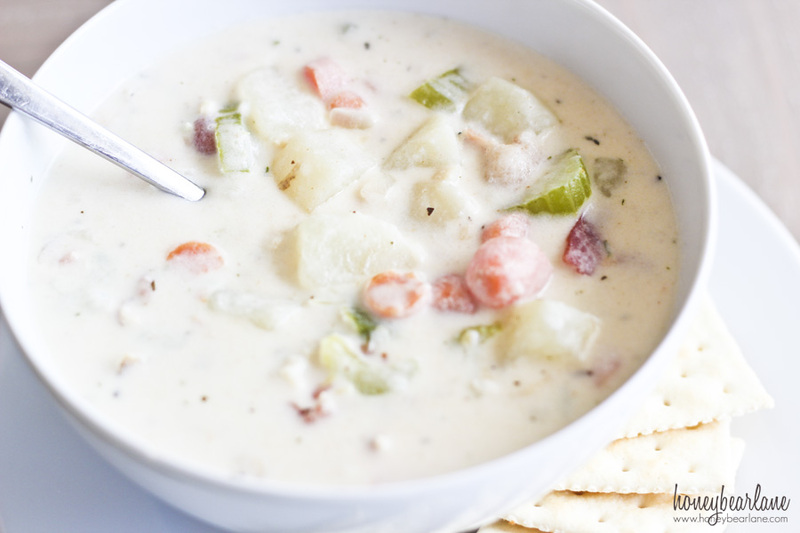 Then add diced potatoes and clam juice–but not the clams. They need to be added last to avoid getting tough. Add a bit more water and a bay leaf until all the veggies are covered and let them simmer under they’re tender. In a large saucepan, make a roux with butter and flour. Whisk it until smooth and let it bubble for several minutes. Add the cream and whisk until it’s smooth. This is where I add in my spices–basil, garlic powder, salt, pepper. Then add in all the veggies which have cooked to be tender. Heat it through but don’t boil. Stir in the clams and add a little more salt and pepper (taste it first and see how much it needs) and red wine vinegar. The red wine vinegar really gives it that over-the-top flavor. Heat it for a couple minutes and then serve. It’s so important to have some type of protein with each meal. It helps you feel fuller and satisfied longer, which also helps with weight management. It’s not always in the budget or convenient to go get fresh proteins, which is why the canned proteins are so great. You can keep them in the pantry for a long time and then use them when you’re ready. And visit Cans Get You Cooking for even more recipes and convenient meal ideas! This post was sponsored by Cans Get You Cooking, all opinions are my own. Linked up with Saving 4 Six, Eclectic Red Barn, The Pin Junkie and Tidy Mom.